Details of man’s first foray to another world have been told repeatedly, to the point where they have become repetitive. It is therefore a welcome change of pace that a new offering helps to detail a little-known aspect of what it took to land 12 astronauts on the surface of another world. At that time, the U.S. government had not shown a tendency toward publicizing their efforts. When men finally set foot on the Moon – more than 90 percent of televisions in the U.S. were tuned to the historic event. What did it take to get the space agency to this point? The new book, Marketing the Moon, details just that. Written by David Meerman Scott and Richard Jurek, the book is filled with color and black and white images to better relay one of the best marketing and public relations programs in U.S. history. With the terms “public relations” and “branding” unfamiliar to the public, NASA relayed the events of our first steps off planet to a worldwide audience hungry for information about what was taking place. Scott and Jurek relay in precise detail how NASA “primed the pump” through the efforts of Wernher von Braun, Walt Disney, the media and those companies who served as contractors and subcontractors on the Apollo Program. Much like the primary rationale for sending astronauts to the lunar surface in the first place, Apollo’s marketing efforts happened at the right time and place, a perfect storm of public relations. Today, most astronauts can walk among us at retail stores and most folks wouldn’t recognize them. Both private and public organizations saw to it that the same could not be said for their counterparts 40 years ago. They were celebrities. Nothing , however, lasts forever, and eventually, the age of the celebrity astronaut drew to a close – a fact highlighted in this book. These days, NASA has a hard time getting the public to show much interest in the agency’s efforts. NASA’s announcements these days are normally met with a collective and barely-stifled yawn. Despite a wealth of documents issued almost daily by NASA – a good portion of the public is still under the misconception that the U.S. no longer has a space program. The masses have become more enamored with the likes of “Honey Boo-Boo” and Miley Cyrus – than with the men and women who risk all in the name of space exploration. The apathy and nano-second long attention span of the public these days is highlighted at the close of Marketing the Moon. For their part, Scott and Jurek have no easy answers, noting that the current plight of NASA is encountered by marketing representatives on a daily basis. Marketing the Moon is a welcome addition to any space enthusiasts collection, providing detailed information about an aspect of man’s first steps off his home planet that, until now, has not been discussed. The book retails for about $40 and is produced by MIT Press. 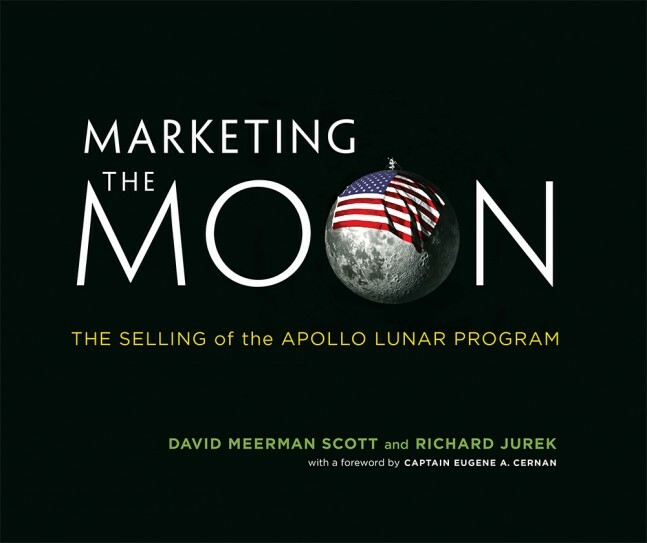 You can find Marketing the Moon either on MIT Press’ website or through outlets such as Barnes and Noble and Amazon.com. For those seeking a comprehensive history of Apollo – it is not to be missed.